By now virtually every trader has personally experienced or participated in a flash crash, whether in FX (most recently two weeks ago when numerous Yen carry pair suddenly tumbled), in stocks or in bonds. But few have observed a flash crash which itself sparks a domino effect of more flash crashes. That's precisely what happened in Hong Kong overnight, when a string of local stocks plunged without warning and without any news in afternoon trading, the second perfectly unpredictable flash crash in two weeks leaving investors nursing massive, and unexplained, losses in the world’s fourth-largest equity market. 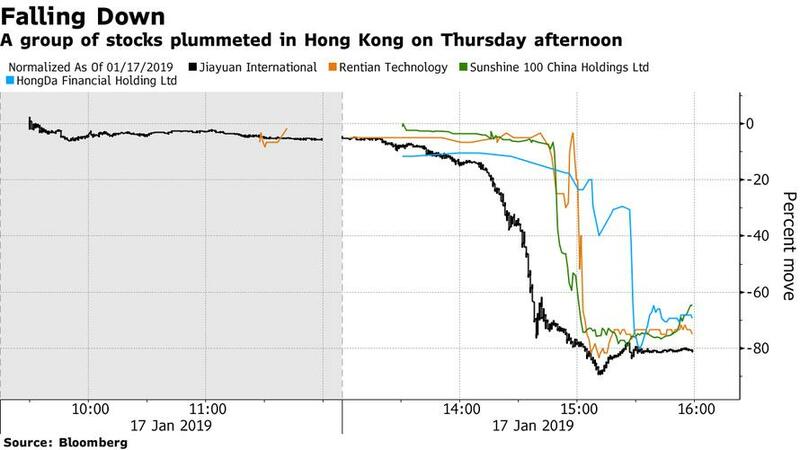 Jiayuan International Group, Sunshine 100 China Holdings and Rentian Technology Holdings all plunged over 75% in a matter of minutes and at least 10 companies by at least 20% or more by the close, wiping out nearly $5 billion in market value. Most of that came from Jiayuan, which lost HK$26.3 billion on record volume according to Bloomberg. What made the latest Hong Kong flash crash episode unique is that it appeared to spark a domino effect, with the first sudden drop catalyzing subsequent collapses: "some of these companies might have cross-shareholdings in each other and when one of those starts to tumble, it brings down other related stocks," said Bocom strategist Hao Hong. "It’s likely more similar stock crashes could happen this year. A lot of share pledges in Hong Kong are underwater, and as soon as the positions are liquidated it triggers an avalanche." 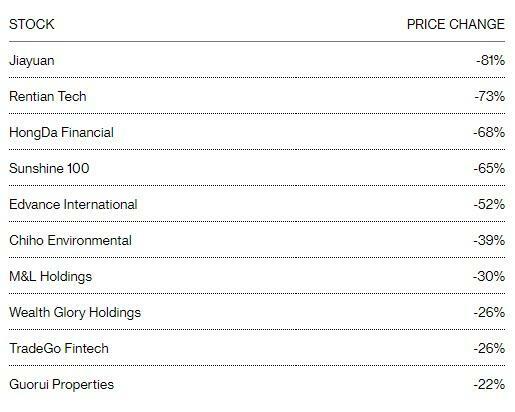 This is not the first time Hong Kong has seen such a coordinated liquidation: in 2017, an “Enigma Network” of 50 stocks roiled the city’s markets triggering a crash in dozens of interlinked companies weeks after noted activist David Webb published a report. More recently, last November more than $1.4 billion was wiped from the value of five small-cap stocks as they tumbled. “People should check the share pledges to see if a stock could suddenly be sold off,” Webb told Bloomberg, his warning falling on deaf ears, again. That said, in this latest crash there may have been a catalyst with some traders pointing to primary culprit Jiayuan’s $350 million of maturing debt. In the fourth quarter, Jiayuan sold $400 million of bonds that mature in October 2020. Those securities fell 30 cents to a record low of 70 cents on the dollar, indicating that some investors may have been worried about an imminent default. The turmoil rippled through to the market for investment-grade Chinese dollar bonds, where spreads were about 2 basis points wider, traders said. However, in a statement Thursday, the company said "it has fully repaid the notes, its financial condition is healthy and operations are normal." Bloomberg also noted another connection: Gu Yunchang is a board member for both Jiayuan and Sunshine 100, showing how deep the linkages between local stocks run. As Bloomberg also observed, on Thursday Jiayuan Chuangsheng scrapped the sale of a 500 million yuan bond ($74 million), a company beneficially owned by the chairman of Jiayuan International. "No one really knows what’s going on here. For common investors, it’s a very surprising and tough situation as there was no time to get out." Investors, and not just in Hong Kong, may want to get used to such liquidation confusion because what happened overnight in Hong Kong is just a harbinger of the mess that will hit every market once volatility explodes during the next crisis as liquidity collapses to zero while everyone demands to get out of the market "right now."